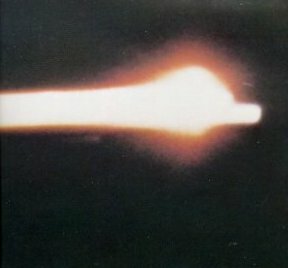 "Longest four minutes I ever spent", said Lovell during the burn, in a comment recorded but not broadcast in real time. At 69 hours 15 minutes Apollo 8 went into lunar orbit, whereupon Anders said, "Congratulations, gentlemen, you are at zero-zero". Said Borman, "It's not time for congratulations yet. Dig out the flight plan." Unaware of this conversation, Mission Control buzzed with nervous chatter. Carr began seeking a signal to indicate that the astronauts were indeed in orbit: "Apollo 8, Apollo 8, Apollo 8." Then the voice of Jim Lovell came through calmly, "Go ahead, Houston." 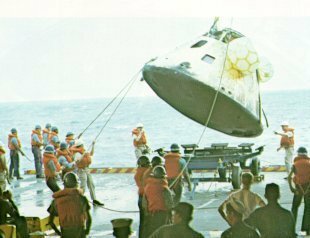 Blazing across the sky, the Apollo 8 command module returns home. A Pan-Am pilot on his way to Honolulu from Fiji glimpsed the sight, and estimated that the fiery streak was as much as 125 miles long. The glowing tail made the spacecraft look like a meteor. This unusual photo was taken by a special USAF camera on a KC-135 aircraft at 40,000 feet. Charred and dripping, the Apollo 8 command module is hoisted from the Pacific and eased down an its trailer aboard the USS Yorktown. Its remaining propellants have to be drained off and its precious film magazines recovered. Then spacecraft engineers will go over it carefully to study the effects of a trip around the Moon. Mission Control's viewing-room spectators broke into cheers and loud applause. Apollo 8 was in a 168.5 by 60 mile orbit on this day before Christmas. "What does the old Moon look like from 60 miles?" asked CapCom. "Essentially gray; no color," said Lovell, "like plaster of paris or a sort of grayish beach sand." The craters all seemed to be rounded off; some of them had cones within them; others had rays. Anders added: "We are coming up on the craters Colombo and Gutenberg. Very good detail visible. We can see the long, parallel faults of Goclenius and they run through the mare material right into the highland Material." During the second egg-shaped orbit the astronauts produced the Moon on black-and-white television (color would not come until Apollo 10). It proved to be a desolate place indeed, a plate of gray steel spattered by a million bullets. "It certainly would not appear to be an inviting place to live or work", Borman said later. An early-morning reception took place aboard the USS Yorktown in the Pacific on December 27, 1968. 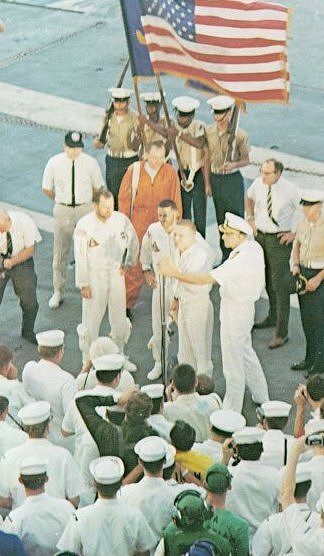 At left, Apollo 8 Commander Frank Borman thanked the crew for giving up Christmas at home so that the carrier could serve as the prime recovery ship. Astronauts Lovell and Anders stood beside Borman. On the third revolution the SPS engine fired nine seconds to put the spacecraft into a circular orbit, 60.7 by 59.7 miles, where it would stay for sixteen hours longer (each orbit lasted two hours, as against one and one-half hours for Earth). At 8:40 p.m. the astronauts were on television again. First, they showed the half Earth across a stark lunar landscape. Then, from the other unfogged window, they tracked the bleak surface of the Moon. "The vast loneliness is awe-inspiring and it makes you realize just what you have back there on Earth", said Lovell. The pictures aroused great wonder with an estimated half billion people vicariously exploring what no man had ever seen before. In the beginning God created the Heaven and the Earth. After four verses of Genesis, Lovell took up the reading: And God called the light Day and the darkness he called Night. At the end of the eighth verse Borman picked up the familiar words: And God said, Let the waters under the Heavens be gathered together unto one place, and let the dry land appear; and it was so. And God called the dry land Earth; and the gathering together of the waters He called seas; and God saw that it was good. The commander added: "And from the crew of Apollo 8, we close with good night, good luck, a Merry Christmas, and God bless all of you-all of you on the good Earth." It was a time of rare emotion. The mixture of the season, the immortal words, the ancient Moon, and the new technolgy made for an extraordinarily effective setting.